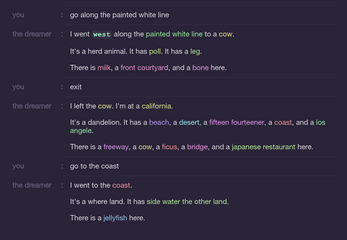 A procedural sandbox text-adventure by @tccoxon. Stuck? Try typing "help" in the text box. This game contains crowd-sourced data, and may vary in quality. You can help by contacting me to blacklist any offensive nodes you find. This version is a remake. The original procjam version can be found here. Dreamer of Electric Sheep is copyright © 2018 Bytten Studio. All rights reserved. This work includes data from ConceptNet 5, which was compiled by the Commonsense Computing Initiative. ConceptNet 5 is freely available under the Creative Commons Attribution-ShareAlike license (CC BY SA 3.0) from http://conceptnet.io. The included data was created by contributors to Commonsense Computing projects, contributors to Wikimedia projects, DBPedia, OpenCyc, Games with a Purpose, Princeton University's WordNet, Francis Bond's Open Multilingual WordNet, and Jim Breen's JMDict. also, according to this: there is a void, it it is a location, in that location is a locker room that contains a body of water and that body of water contains a blowfish and a boat, the blowfish is, repeat is, meat and head! However the boat has flipped over has capsized and boat whistle and has a propellor. while Inside it is a bikini babe, a fisherman, a pump, and a deck. This is nuts! 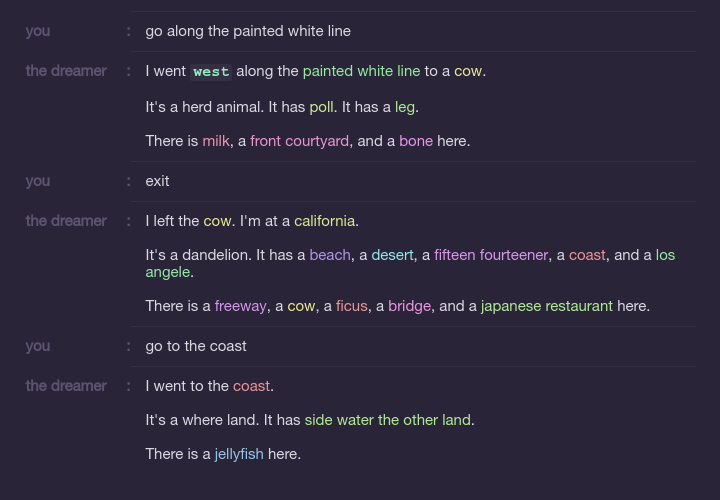 PS Almost all of this was copied and pasted so every where connector word comes from it, example: the fish IS meat and HEAD, boat has flipped over has capsized and boat whistle and has a propellor. I told it to create an alexa and it said: I have an alexa. It's a pressing keys with her finger. It has a kid.